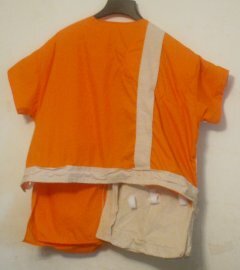 Available for Sporting Clay and Trap shooting in Safety Orange Light Cotton/Polyester fabric and Beige colored Heavy Cotton Duck. Three heavy duty pockets for full course of loaded shells in heavy duck side. Two large pockets on light side. Light fabric short back for comfortable summer day time shooting. Low profile Recoil Pad for quick, unobstructed shouldering of gun stock on heavy duck side also extends over shoulder to comfortably help support heavy pocket loads. Belt loops with easy velcro fasteners. Available for Upland hunting in Green camo Light Cotton/Polyester fabric and Green camo Heavy Cotton Duck. 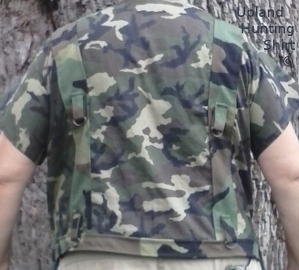 Green Upland shirt has rings for fastening Game bag or Seat (sold seperately). Heavy duty pockets for plenty of loaded shells. Light fabric short back for comfortable day time shooting. Low profile Recoil Pad for quick, unobstructed shouldering of gun stock on heavy duck side also extends over shoulder to comfortably help support heavy pocket loads and Game bag. Belt loops with easy velcro fasteners. Cool breathable fabric with heavy reinforcement just where it is needed. 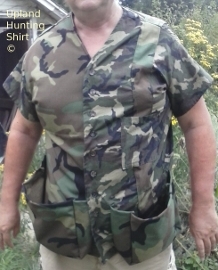 Vest has the same basic design features as the shirt above, including belt loops behind top of heavy pockets. Reinforced belt area including rings on Upland model opposite rear belt loops for fastening Game Bag. Padded shoulders and reinforcing for partial distribution of weight in pockets to rear belt loops. Padded Game Bag matches Green camo Upland Vest or Shirt. 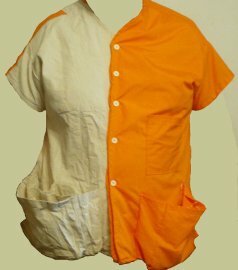 Heavy Cotton Duck zipper cover is removable for washing. Inner plastic layer keeps padding dry. Padded Seat matches Green camo Upland Vest or Shirt.